It’s an old idea (but still strong I think) that heterogeneity in networks is linked to innovativeness and homogeneity is linked to stability. However, we are not just talking about: What are the networks that produce the wildest, newest, most excitingly buzzing ideas? But: what are the networks, where new ideas actually come to fruition? Now the answer is far less simple. Looking at organizations I know, I would say, you need a network that has heterogeneous and homogeneous areas that are responsible for different parts of the creative and practical process that leads from having a new idea through testing, implementing to mainstreaming an innovation. So in the different parts of your organization you need people with different networking capabilities. Have some wild thinkers, who like socializing with people far beyond their own field, who develop fluctuating, heterogeneous not very stable networks of inspiration and can serve as a floodgate of new ideas for your organization. But make sure that you team them up with people who network a bit more conservatively, who can channel and filter these ideas into something suitable for your field – however, these people have to be open enough, to see as good idea even if it comes from a different field. And then you need your technical experts, who do the nitty gritty testing and perfecting and have reliable long term networks with people from very similar fields that allow them to turn the idea into a state-of-the-art reliable application. From there you go to the more heterogeneous networkers again, when you look at targeting audiences for implementation. The challenge: People often tend to want with people of a similar kind, so you’ll easily end up with teams of wild thinkers, who have the greatest and grandest ideas that never see the light of day – or with teams of reliable conservatively thinking experts, who will get you perfect and reliable applications that are rather uninspiring and not very innovative. So if you look at innovativeness in networks it’s not enough to look as a general heterogeneity index. Rather understand the different heterogeneity needs that occur along the process. I’ve been thinking of an online version of Net-Map for a while now and my first web-based Net-Map training seminar encouraged me to go further in this direction. During the training I basically directed people I couldn’t see to draw paper maps in their own offices on the Philippines or in India, which is not realizing the full participatory potential of the method. Basically I felt like a blind person teaching someone how to paint. Now the Knowledge Management for Development Community (KM4Dev) asked me whether we could use Net-Map at their annual meeting to get a better understanding of the links within and beyond this community. And while we will do a lot of this face to face and I’m looking forward to the buzz in the room, we are also considering those who cannot participate in person. Steeve Ebener, who uses social network analysis in the context of accessibility of health care for the WHO, pointed me to this very early predecessor of modern day SNA. A thought that a lot of us facilitators, world-changers, development activists, drivers of change, researchers for development need to sometimes remember, sit down, hold our faces into the sun, breathe out and have a big piece of cake. And a nice weekend. That’s just a limited choice of the very different issues that my training participants on Wednesday were concerned with. So they drew maps about real and potential cases in developed and developing countries, from the international to the local level. As always, alas, time went too quickly and I wasn’t able to take everything in, that happened. Especially with the online-participants, who sat in their own offices all over the world, following my directions in drawing their maps… at least that’s what it sounded like. I hope that some of them will still be able to send me pictures and a discussion of what they drew and how it worked. I have recorded the workshop and promised to upload the whole thing, slides and web-cam and voice. But it needs to be cut and straightened first and as these things always take time, I’ll make the slides (876K) available right now, for those of you who don’t want to wait. And, given the interest was much bigger than the places available, I’ll look into organizing the next training as soon as possible. 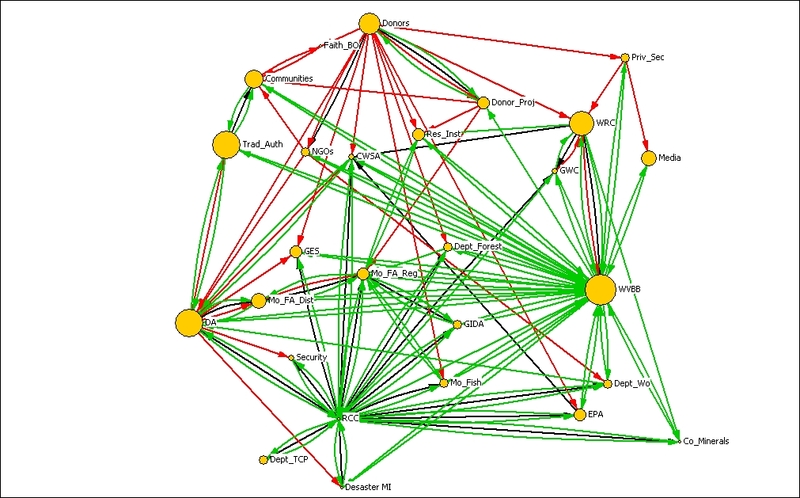 The Knowledge Management for Development (KM4Dev) community has a great Wiki which has an interesting introduction on Social Network Analysis within the field of knowledge management, which is worth checking out, if you want to learn more of the background of the approach. Sounds great. But how do you do it? How can we as researchers for development do projects that have an impact on governance in the countries we work in? Or, is there a problem in this question already, as it sounds like: First we do research, then we go and have an impact. doing embedded research (like embedded journalism) that just finds out what the powerful wish to hear and serves particular local vested interests? I have promised to write about this question and am planning to interview governance actors in Ghana about their experiences with research – and talk with researchers about their experiences with trying to have an impact. As I am developing an appropriate tool I am toying with the idea of asking people about their best and worst experiences, following an approach developed by a group around the German organizational psychologist Siegfried Greif who analyzed the success and failure of organizational restructuring in the corporate world. And I’m drawing a Net-Map reflecting on my own experiences in Ghana. What I end up doing is to fill the whole surrounding space around the map with my written comments about the links that are positive drivers and those that are obstacles for integration, note down the many remaining questions and more general observations about this slowly evolving fruitful collaboration. With this added qualitative commentary the map looks so much more informative and self-explanatory than a map that just consists of actors and links.